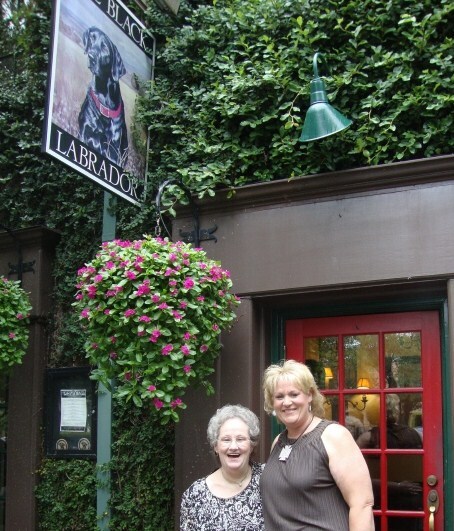 The Black Labrador is located on Montrose in the University of St. Thomas area. Glenda Burns Minniece (who sent these photos) described it thus: "The Black Lab has a lot of different foods but also has a lot of British influence. The room we were in was the Churchill Room and we were surrounded by photographs and posters of the great man. Some have said that he was the greatest person of the 20th century." Here at the entrance to the restaurant are Joan Williamson Fox and her daughter, Dana Douglas. Dana brought her mother because Joan has been in the hospital recently and has not been cleared yet to drive.